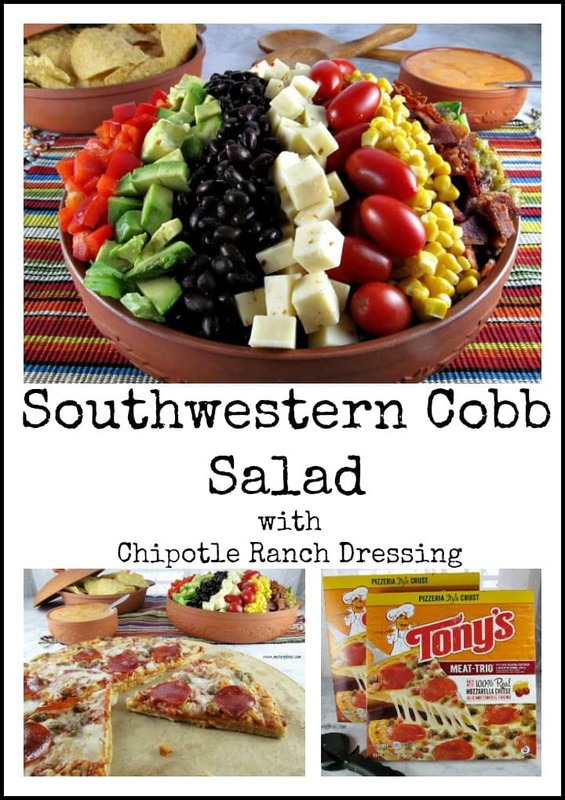 Even though this Southwestern Cobb Salad would make a great main dish we are rocking our Friday Night Football dinner by pairing it with a great pizza. I don’t know about you but here in Texas, High School football is a major event. So our Friday football night dinners need to be quick, delicious and nutritious! I have two grandsons that play football in Texas and Friday nights are very busy at their house. They both need plenty of fuel before they hit the field and their mom needs easy meal ideas. 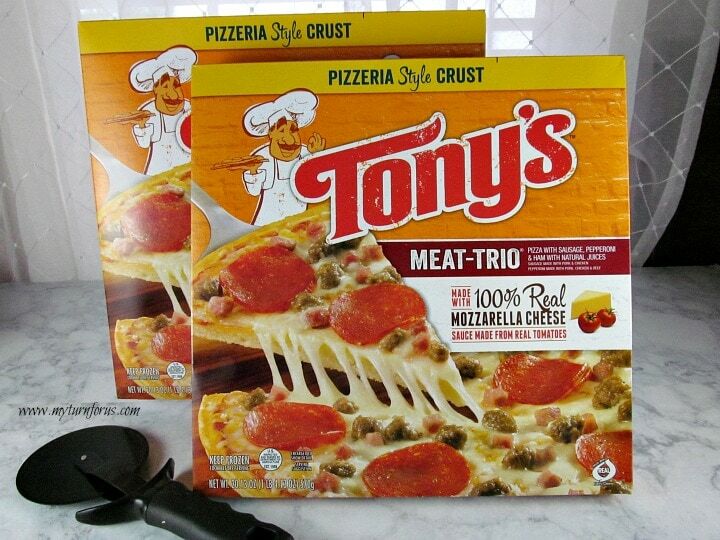 I was in Walmart last week and found these Tony’s® Pizzeria Style MEAT-TRIO® Pizzas in the frozen pizza aisle. 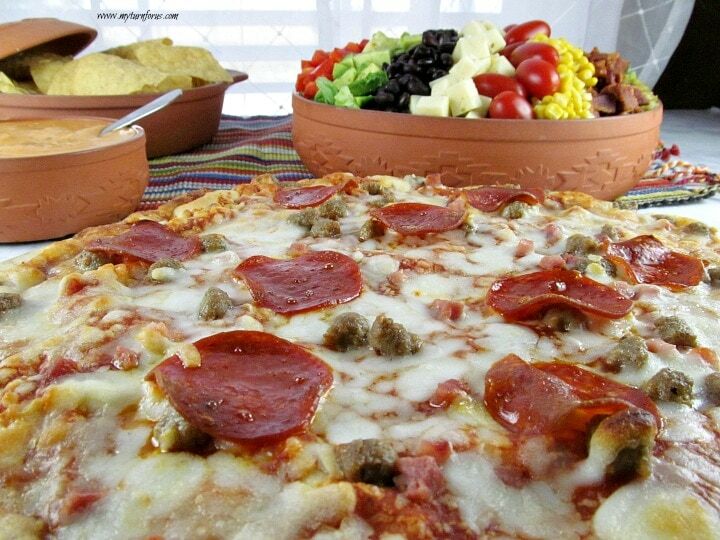 There are several different Tony’s® Pizzeria style pizzas to choose from such as Pepperoni Pizza, Sausage, and Pepperoni pizza, Cheese Pizza, Supreme Pizza or our favorite Pizzeria Style MEAT-TRIO® Pizzas. 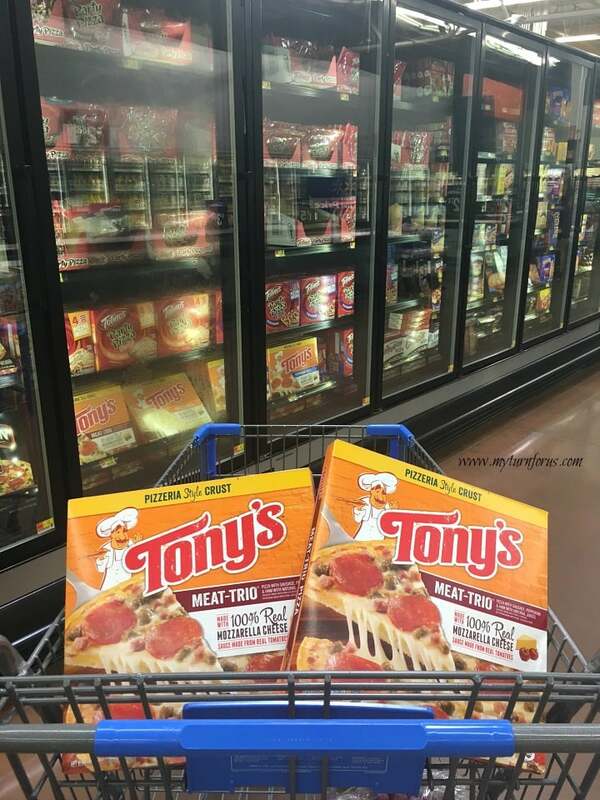 I knew these pizzas would be a great option for Football Friday at my daughter’s house and since there is a great deal on these Tony’s® Pizzeria Style pizzas at Walmart, she could save money while feeding those growing boys. When I was in high school, I attended a small (a tiny) West Texas High School and we played 6-man football. When I was in the 11th grade there were only 14 total students in our high school but we still had a great football team. Seriously the entire town would turn out for Friday night games but that was less than 200 people. Yep, the reason we played 6 man football was that there were not enough guys to play 11 man football, in fact, we didn’t even have enough members on the team for an offensive and a defensive squad. The guys played the entire game with less than 3-5 other players for rotation and every guy in high school played football. If you ever get a chance, go watch a 6 man football game, it’s fast and it’s wild. Friday nights were always special, the field lights would turn on and the entire town would start showing up to cheer us on. Dinner was served early so we could all be there to get everything ready for the game. We didn’t have an extra support staff so we all had to pull together to prepare for the game. And we were proud, Texas Proud of our Toyah Buffalos! These are great memories and sad to say, there is no longer a school in my hometown. It was just too small to survive without being incorporated into the next larger town. But I am glad I was a part of this tradition and I do miss those times. Now I am enjoying my grandson’s playing Friday night Football at their school which is much much bigger but the pride is just as strong. My grandsons are like most kids, they are picky eaters, one more than the other. We are always looking for ways to feed these little energy burners with healthy nutritious food that they actually like. I know my grandsons will love these pizzas because these pizzeria-style pizzas are delicious and authentic and they are made with 100% real Mozzarella cheese and the sauce is made from real tomatoes. Tony’s has been making these pizzas since the 1960’s and has taken great pride in serving communities like ours. And these Pizzeria style pizzas taste authentic with a crunchy crisp crust and it all started over 50 years ago in Salina Kansas in a local pizzeria. 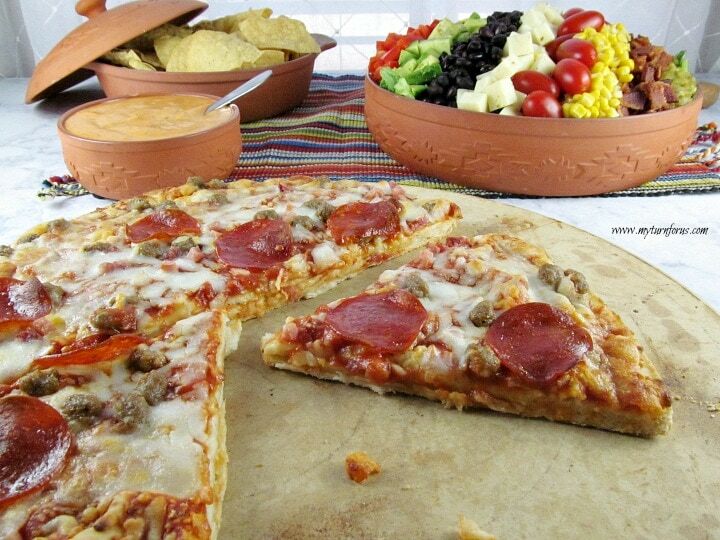 We decided to pair these pizzas with a salad that was loaded with gorgeous vegetables. 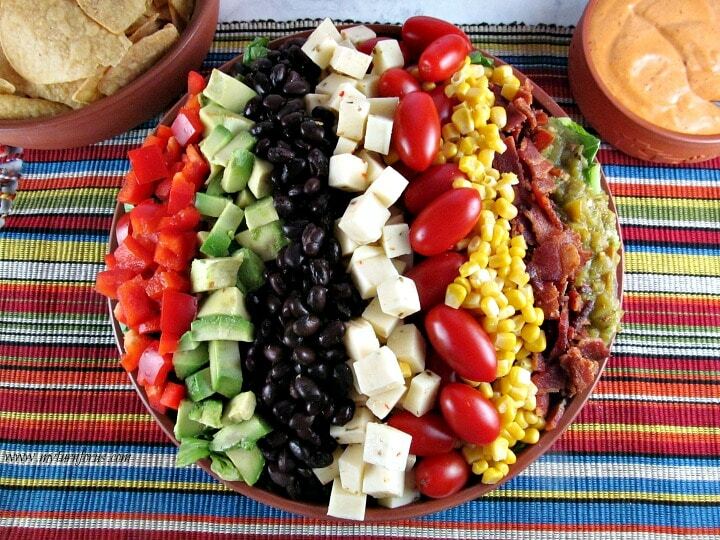 We had the idea of a cobb salad with lettuce topped with layers of several different vegetables and proteins so the boys could serve themselves. That way our picky eaters could pick and choose for themselves from a combination of healthy toppings. 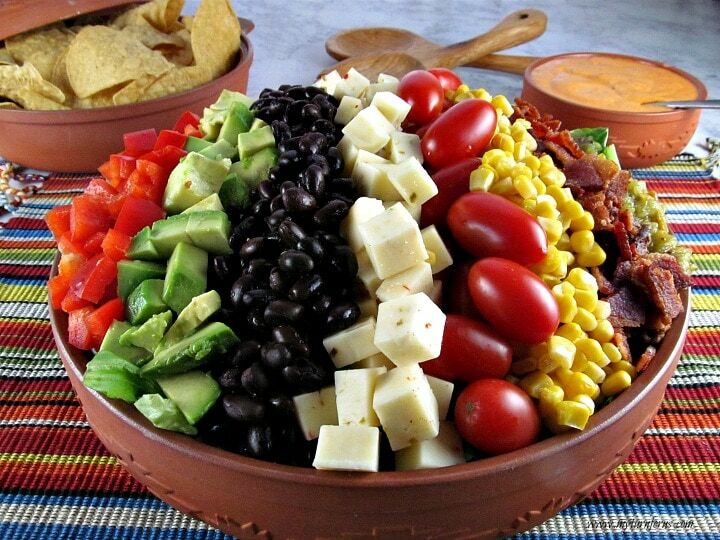 And being in Texas, our Cobb salad is loaded with Southwestern flavors for a great Tex Mex Salad/Side dish. We made our Friday night even easier by preparing the salad ingredients the day before. We cooked and chopped the bacon, cubed the cheese and chopped the red bell pepper. We drained the corn and rinsed the black beans and placed them in covered bowls in the fridge. Everything was placed in the fridge ready to assemble while the pizzas were cooking. The dressing is even better if it is made and stored in the fridge overnight for the flavors to marry. Two Tony’s® Pizzaria style MEAT-TRIO® Pizzas and a huge bowl of Cobb salad and our football players and fans were ready for a great Friday night of Texas High school football! What are some of your Friday High School Football traditions or memories? Please Don’t forget to pin for later!